Transfer chickpeas to a lined cookie sheet and bake for about 1 hour, stirring occasionally until golden and crisp. Remove from oven. Let cool on a paper towel lined tray. 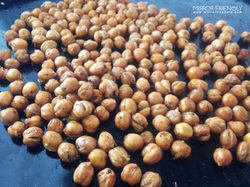 Store your roasted chickpeas in an airtight container at room temperature. Also, if you are purchasing canned chickpeas, their size varies among brands. Larger chickpeas work best for this recipe. I hope you enjoy this recipe as much as I do.